Lisl: I don't get this sort of opportunity at home very often, Ray! Well... that's awful... But a good shot.. Excellent shot. Nature has no abattoir regulations. Eating alive happens in a number of hunter/prey events. Fortunately the shock effect kills the prey fast enough ... but yes, it could have been different. The police might be interested in this evidence Lisl. Lisl: We don't seem to have any in this area, Chad! Nature is cruel Lisl. Always was, always will be..
Oh, the dove looks being full of fear. You could not drive away the hawk making some noise? What an amazing shot, these opportunities don't come along very often. Oh, how awful to witness but such is the nature of bird life. I often see hawks with voles scooped from the fields. What a fantastic sharp closeup capture you've presented here, Lisl. Could very well be one for a nature publication. this is a rare and unusual shot, Lisl. i imagine this happens in nature more often. Oh dear! Hopefully the dove will meet a quick end. 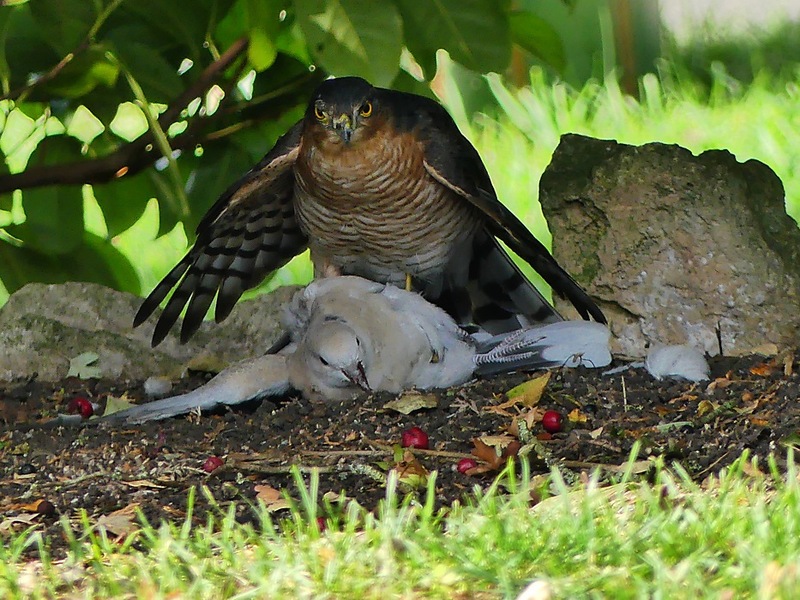 I wanted a sparrowhawk with a pigeon in Ambleside a few years ago; again not a good sight. An excellent photograph. Poor dove!